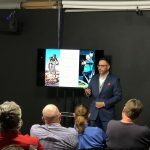 Great presentation last night sponsored by: ASMP & PAC with Everardo Keeme about Commercial Photography related to Sports & commercial events. Lots of amazing information and quotes to learn from. These meetings are run every month and topics/speakers are always new, and changing. Be sure to follow our Facebook Page Events to see upcoming, classes, workshops and seminars.